It’s Turkey Claus time again! The holidays can be a busy time, and excuses are easily made. Join the Turkey Claus challenge to help you stay motivated and feeling great during the holidays. Can you do it? Let’s yoga! Grab a card at the front desk and after class between Nov. 22 and Dec. 25 get your card stamped with one of our holiday stamps. To enter the drawing, hand in your card when you are done, and we will hang it up in the studio! 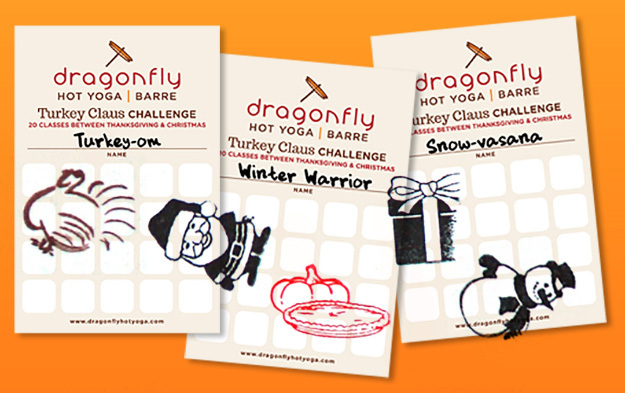 Everyone who completes the challenge and hangs up their card will be entered into a drawing for a chance to win a Dragonfly retail item of your choice!